At the end of their life, trees reach their twilight, stage six. 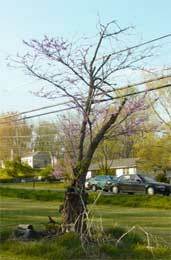 Large limbs die and break off, leaving a small crown of scattered large limbs and short twigs. Monitor the tree’s base, and make sure it is not becoming unsound. Shade trees can be kept safe by continuing to remove dead limbs. When caring for trees in their twilight, it helps to remember that, for many trees, this phase can last for as many as fifty years; they usually don't go in a hurry.